The Bierworth family was honoured at the North Hastings arena Saturday night just before Bancroft’s Bierworth Readi-Mix Bantam Jets took the ice to start their All-Ontario finals series. The Bierworths have sponsored teams for 45 years. 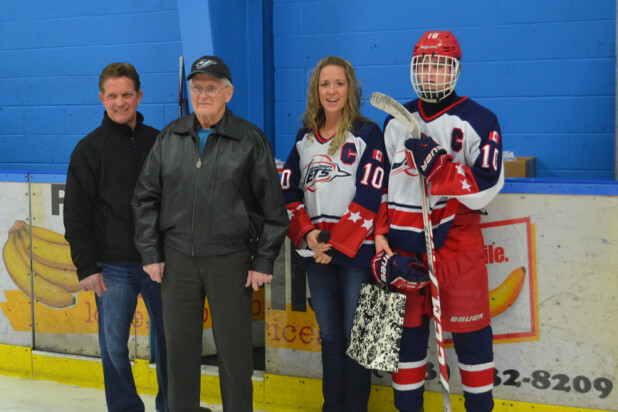 In the photo: Bob and Carl Bierworth with Bancroft Minor Hockey president Becky Cooney and team captain Brody Cooney. Let’s just say that the Bancroft Boyer Group Midget Jets didn’t play the best hockey of their season when the All-Ontario CC Finals opened on Saturday night. The Ilderton team from the London area, also named the Jets, in the end coasted to a 4-1 victory. A spectator who has played in an All-Ontario midget final ventured that nerves were a factor with both teams. “Suddenly you’re the centre of attention of a very large crowd; it can upset your focus.” The arena was certainly full on Saturday, with at least 600 cheering spectators. Both teams, which played very well to reach the Ontario final, made mistakes they wouldn’t normally make. Most of the goals came on turn-overs in the team’s own end. For long stretches, the game was scrambly and lacked play development. Still, there were opportunities, especially when Bancroft’s Caleb Trotter buried a great shot to pull the team to a 2-1 score. However, Ilderton quickly came back with a goal of its own, and the game didn’t seem close after that.